To ensure the next generation of vehicles are properly repaired, leading Auto Manufacturers are doing their part to ensure that body shops have the proper tools, equipment, training, and facilities to repair vehicles to manufacturer specifications, ensuring the fit, finish, durability, value, and safety of the vehicle. Assured Performance works with the top Auto Manufacturers in the country to identify, certify, and promote these best-in-class repair businesses through one joint-effort program. This approach eliminates redundant costs and duplication between programs, saving time and money for all concerned. 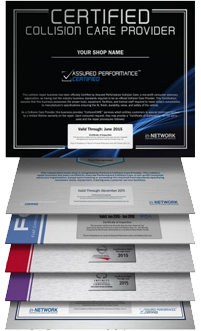 Get Certified by Assured Performance, and you can be officially Certified-Recognized by FCA, Nissan, Infiniti, Hyundai, and Kia. With a program that is continually expanding and adding new OEM partners, you can't afford to miss out on the opportunity to be "Certified Once and Recognized by Many". Only 1 in 10 shops will meet or exceed the requirements for Certification. In order to become and remain Certified, shops must meet the requirements as established by the Auto Manufacturers and pass an annual on-site inspection-audit. These requirements identify Certified shops that have the proper tools, equipment, training, and facilities to safely repair the next generation of vehicles, ensuring the vehicle fit, finish, durability, value, and safety using advanced materials and technology. Assured Performance “Certified Collision Care Provider” videos offer the Assured Performance Certified Network a peak into what they need to do to take their Certified business to the next level, from being OEM Certified to being an OEM Certified Collision Care Provider. Each video plays a strategic role in demonstrating the importance of being a Certified Collision Care Provider. Learn what is available to you as an OEM Certified shop and how to use each of the systems and tools to become the most valuable Certified Collision Care Provider and continually increase the value of your business. Certification makes you part of a joint-effort program of best-in-class body shops, creating a positive image for the collision repair industry, its stakeholders, and customers. As part of this elite network, your Certified shop can leverage exclusive marketing, business improvement tools and increased top-line growth. Referrals direct from OEMs, connecting Certified Shops with customers. Listing in the online body shop locator linked directly from the OEMs web sites with a personalized micro-site and link to your shops website. Listing on consumer-facing Assured Performance Collision Care (consumer advocate) shop locators. Access to an arsenal of Collision Care marketing materials to differentiate Certified Shops from local competition. Periodic press release communications distributed to your local media. Online appointment setting and electronic dispatch to your shop from the locator and smart phone apps. Thank you for your interest in Certification. Get Certified by Assured Performance, and you can be Officially Recognized by FCA, Nissan, Infiniti, Kia, GT-R and Hyundai. With a program that is continually expanding and adding new OEM partners, you can't afford to miss out on the opportunity to be Certified Once and Recognized by Many! Enter your shop's main phone number. If you experience problems, please call an Account Manager at: 949-221-0010.